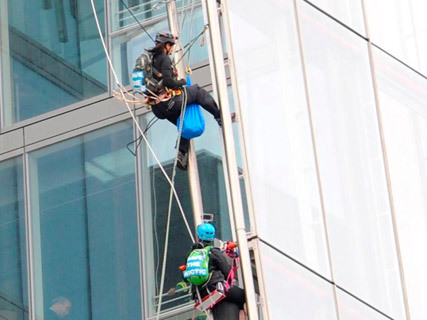 Six female Greenpeace activists are attempting to scale The Shard to protest against drilling for oil in the arctic. It’s thought the group began their climb at 4 o’clock this morning, after climbing onto the roof of nearby London Bridge station. The Metropolitan Police say officers were called to the scene at 04:25 BST, while Greenpeace have confirmed the protesters are members of their charity. According to a blog posted on the Greenpeace website this morning, the activists are protesting against drilling for oil in the arctic, by large companies including Shell and Gasprom. The piece, which was written under the name ‘victoriah’, describes the intense training regime and preparation the women have been through ahead of the event, and the reasons for their protest. ‘With any luck, as you read this I’ll be clinging to the side of the Shard, hundreds of metres up in the sky,’ the post reads. ‘But as I write this, with less than a week to go, I’m just feeling… tired. I have sores on my shoulders from training with backpacks full of weights, and every night brings tiresome dreams about carabiners and tangled ropes. In a statement, Greenpeace said the six protests were all ‘artists’ and ‘activists’. ‘If the six women reach the top – 310m above the pavement – they will attempt to hang a huge work of art that captures the beauty of the Arctic,’ it read. This morning a spokesman for The Shard – the tallest building in Western Europe – confirmed the protestors’ actions, and said their main priority was the safety of both those climbing the building, and visitors to it. ‘The Shard is being used by protestors as part of a campaign,’ the representative said. ‘Our primary focus is on the safety of the protestors and the workers and visitors to the building. A spokesman for oil company Shell said: ‘We respect the right of individuals and organisations to engage in a free and frank exchange of views about our operations … we only ask that they do so with their safety and the safety of others, including Shell personnel and customers in mind.